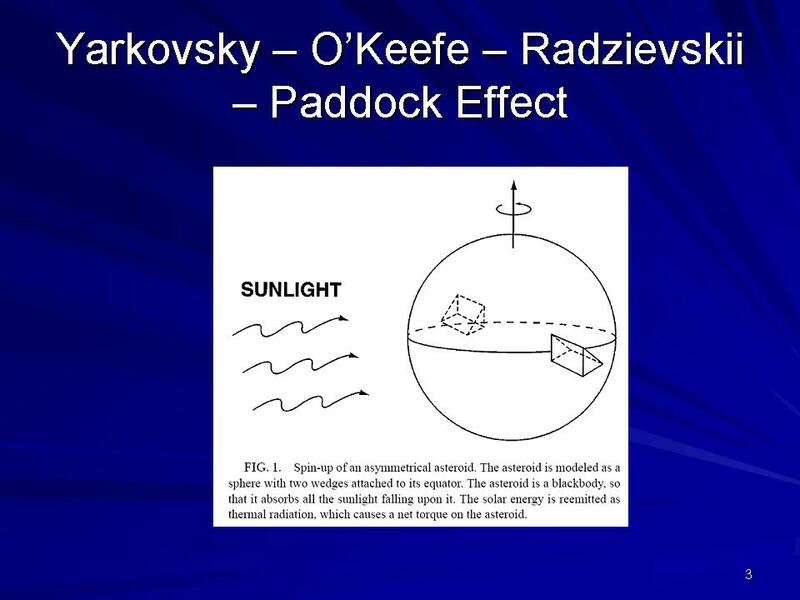 Yarkovsky effect The Yarkovsky effect can slowly alter the orbits of asteroids, as long as they have stable orbital spin axis direction over a long period of time. The effect can act to either increases or decrease the size of the orbit of the asteroid, depending on the sense of rotation with respect to the orbital motion. 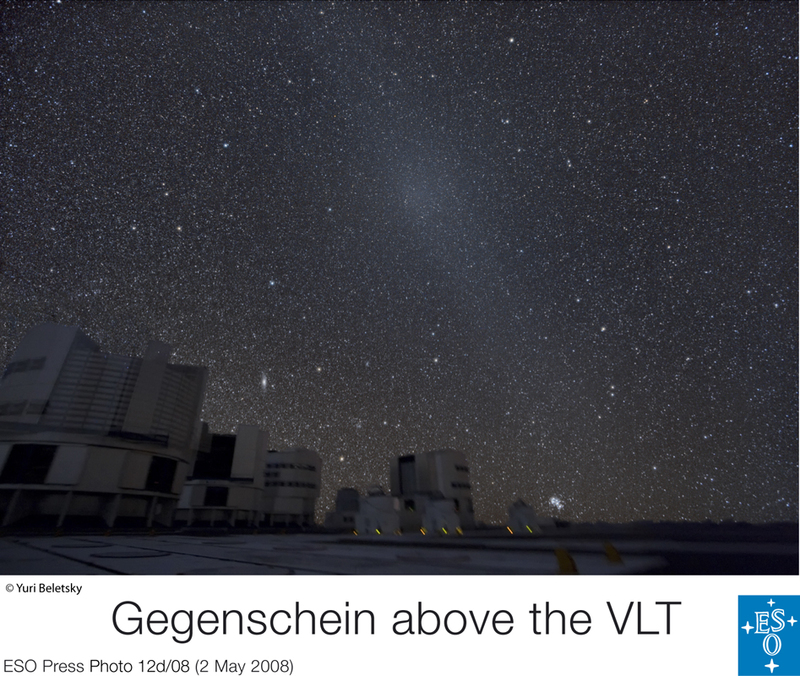 (diagram from Sky and Telescope April 2004). YORP effect If you imagine photons as a "wind" then you would see that as photons hit this body, there would be a net torque on the body, just like blowing on a windmill imparts a torque. 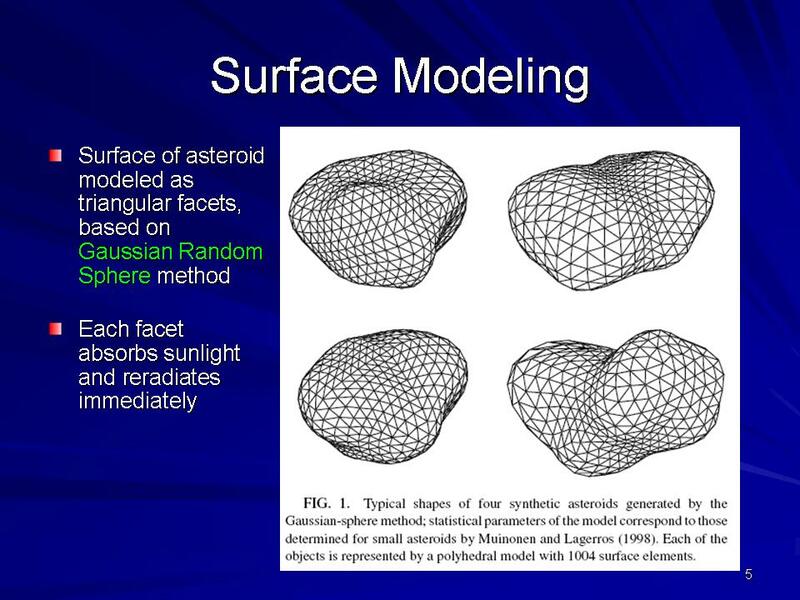 Model asteroid for YORP effect Real asteroids often have irregular shape. 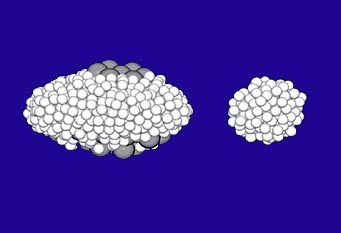 To do computer modelling of the YORP effect on "real" asteroids, sometimes models of asteroid shapes are made with trianglar "tiles". As each tile has a definite angle and size, one can predict the Yarkovsky effect using a computer model. One also must assume parameters like the surface albedo, thermal inertia of surface, and surface roughness. 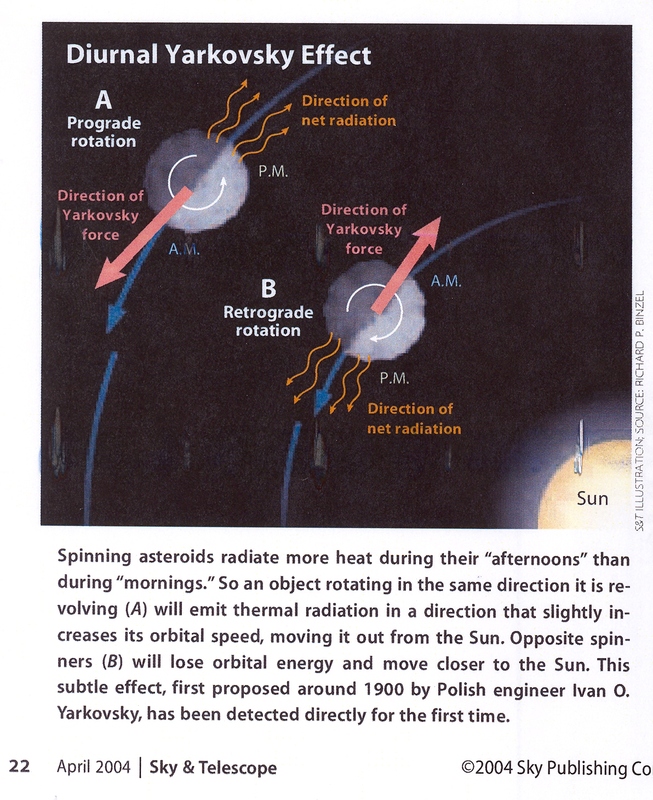 Asteroid fission due to rotation This is a diagram of an asteroid which has just shed a moon due to rapid spin. The "spinup" was due to YORP effect. As I talked about earlier, we now know that binary asteroids are quite common- indeed, perhaps 1 out of 6 NEA asteroids may be double! 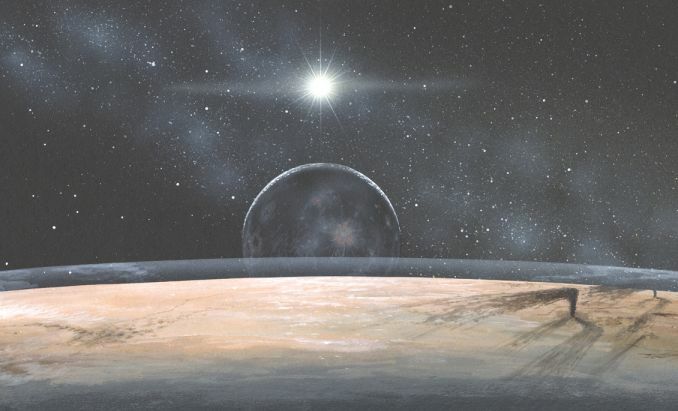 Now the question is - how did all those binaries originate? The YORP "spin up and rotational split up" model can provide a very plausible origin for many binary asteroids. 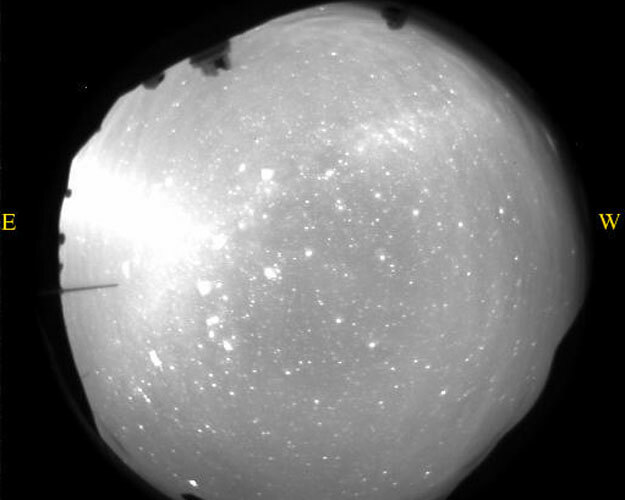 Spin axis from lightcurves By observing the lightcurves of an asteroid at different positions in its orbit around the Sun, one can measure the position of its spin axis. Aligned spins of Koronis family The spin axis directions of a sample of Koronis family asteroids are aligned in one of two directions- one for prograde rotators, the other for retrograde rotators. 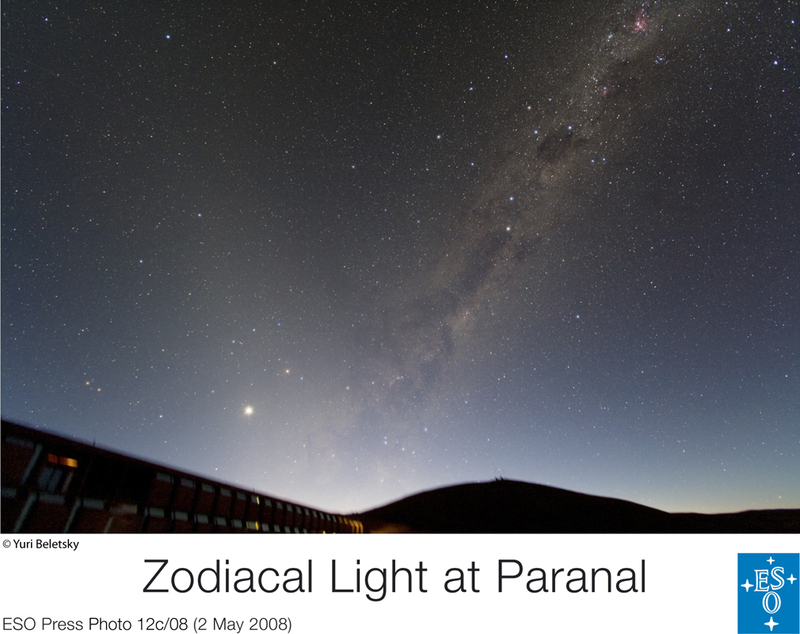 (diagram from Sky and Telescope Jan 2004). This is a quite stunning result. 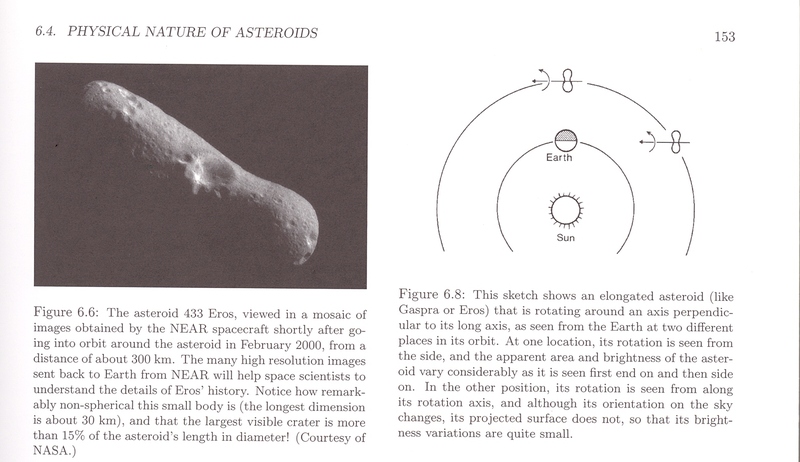 Most people had thought that asteroid spin orientations are randomly changed by collisions, so that the orientations should be randomly distributed over the sky. This grouping of directions argues strongly that the collisional idea is flat out wrong. The YORP effect tends to orient spin axes perpendicular to the orbital plane of an asteroid, and probably can account for the Koronis family result. 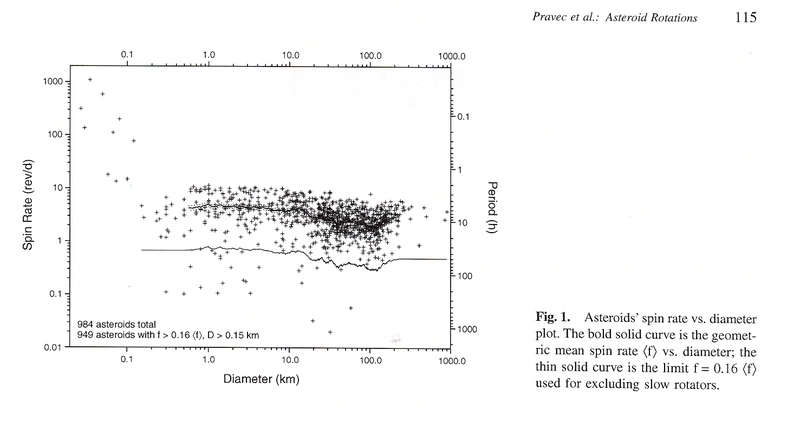 Asteroid spin rates vs diameter Rotational periods are known for over 1000 asteroids at present. 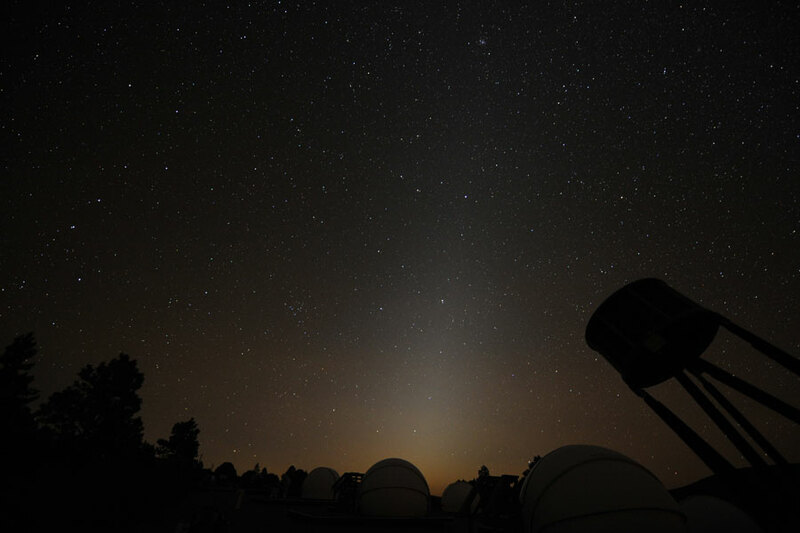 Many were determined by amateur astronomers with small telescopes and CCD detectors. When plotted versus asteroid diameter (usually estimated from IRAS thermal infrared flux) several things are seen: (1) the average period is about 8 hours, although it seems that asteroids in the 1 to 10 km size have somewhat smaller rotational period than larger asteroids. 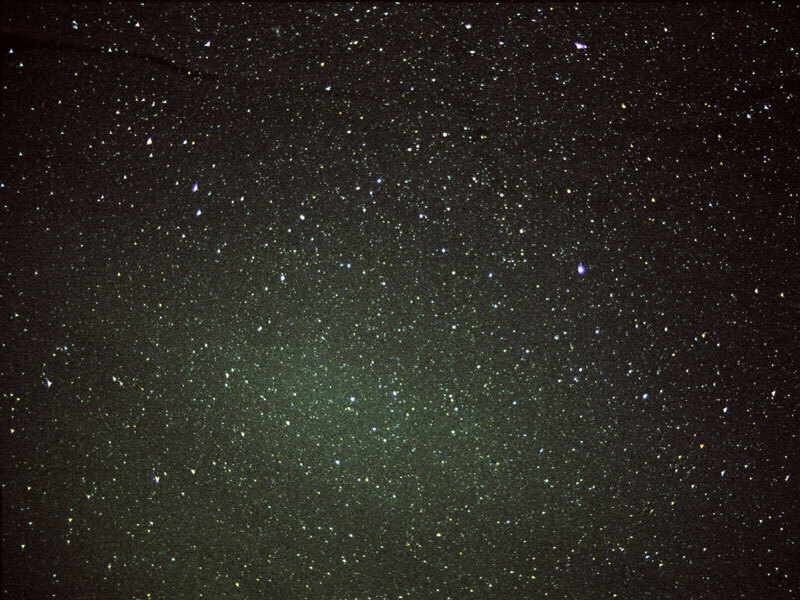 (2) Except for the smallest asteroids (D < 0.15 km) there is a "barrier" at about 2.2 hours. 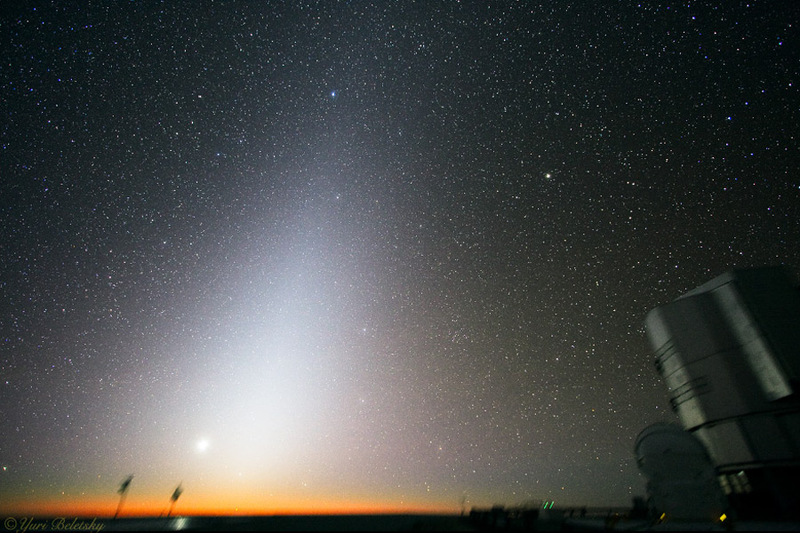 No asteroids with D > 0.15 km have periods less than 2.2 hours. 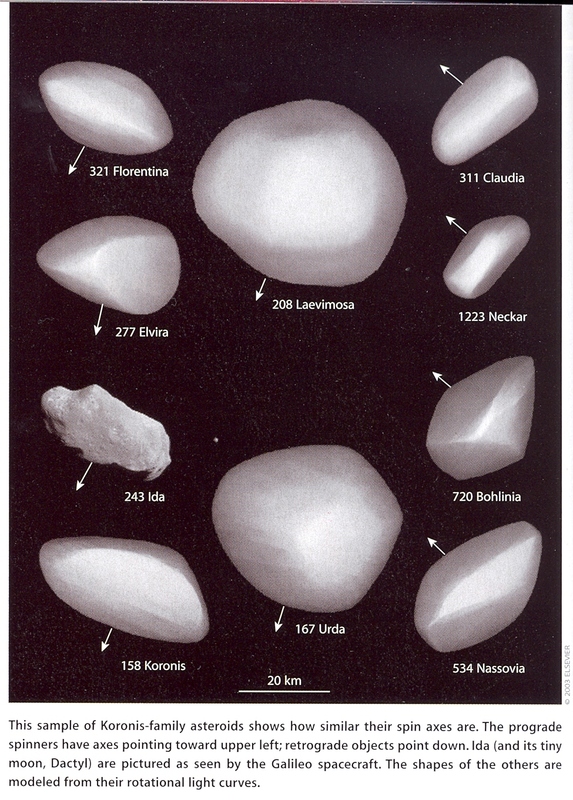 (3) The smallest asteroids (D < 0.15 km) are almost all "superfast rotators" with periods from a few minutes to an hour. The 2.2 hour barrier is thought to be due to the fact that asteroids are mostly "rubble piles" with little internal strength. If they spun faster than 2.2 hours, they would fly apart. The small superfast rotators may be objects which have much more internal strength. They have been called "monoliths" (single rocks) but they need not have that degree of internal strength to keep from flying apart. 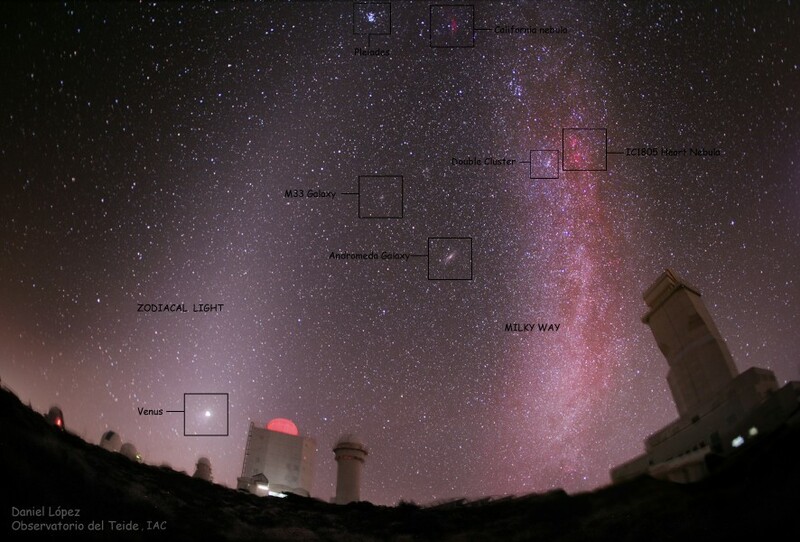 This figure represents many thousands of nights of telescope time.